April 28, 2011 - Sikorsky Aircraft Corp. announced that the Defense Industry Executive Committee (DIEC) has selected Sikorsky for a contract involving 109 derivative Black Hawk helicopters for multi-mission use by the Turkish Government. Sikorsky Aircraft is a subsidiary of United Technologies Corp.
Sikorsky will finalize contract details with the Undersecretariat for Defense Industry (known in Turkey as SSM) and Turkish Aerospace Industries (TAI). The aircraft will be assembled in Turkey by TAI as the prime contractor and will include components supplied by Sikorsky and other American and Turkish companies. The DIEC has reported the total program value to TAI at $3.5 billion, inclusive of work to be performed by Sikorsky and other program partners. As part of its contract proposal, Sikorsky will invest in expanding the dynamic components manufacturing capability of Alp Aviation, which is 50 percent owned by Sikorsky. Additionally, the industrialization proposal will allow Turkish industry access to the Sikorsky global supply chain including sale of Turkish assembled aircraft to future Sikorsky international customers. The DIEC has estimated that the export potential coupled with future Turkish indigenous requirements could reach 600 helicopters. The expected 10-year contract also would call for aftermarket support, including training and maintenance, leveraging Sikorsky?s and Turkey?s existing maintenance infrastructure to provide service and to supply parts and components to customers worldwide. ?For many years, Sikorsky Aircraft and Turkish industry have collaborated on aerostructures and dynamic component parts, so this contract would follow a longstanding tradition of cooperation,? said Sikorsky President Jeffrey P. Pino. ?Sikorsky looks forward to entering into this expanded partnership with Turkey to meet their present and future rotorcraft needs.? ?The Turkish Utility Helicopter, derived from the BLACK HAWK helicopter, will be an advanced, combat-proven, multi-mission helicopter that can meet all of the mission and performance requirements. 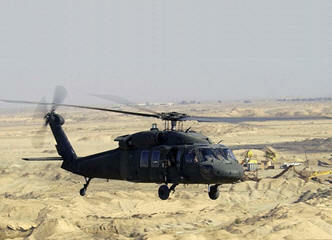 The configuration of the T-70 baseline helicopter is based on the S-70i Black Hawk helicopter,? said Mick Maurer, president of Sikorsky Military Systems.